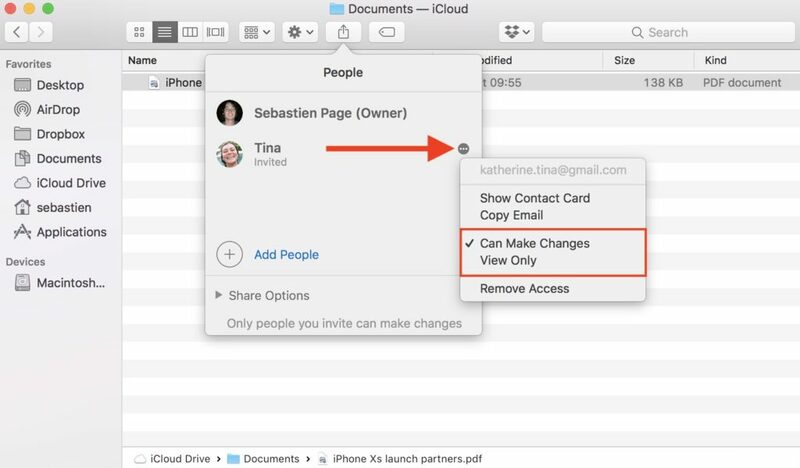 iOS11 and macOS High Sierra offer the ability of sharing documents in iCloud, which means you can invite other Apple users to collaborate on a document stored in your iCloud Drive. In this post we are gonna show you how to share iCloud Drive files on macOS High Sierra, allowing other people to view or edit the files. Note that this method requires the recipients to have an Apple ID/iCloud account, so that they can access the document on their Apple devices or through the iCloud.com website. Open up Finder, and head to iCloud Drive folder from the sidebar. 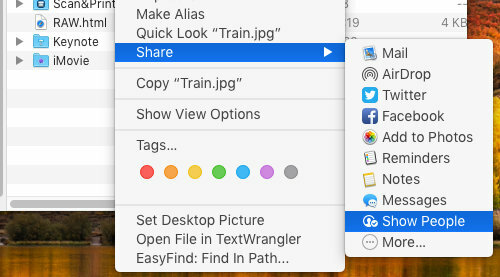 Select the file you want to share, click the Share icon at the top of the Finder window, and then select Add People option. If you don’t see the Share icon in the Finder window, head to the Share menu from the Menu bar and select Add People. In the Add People window, select the way you want to invite people to access to this file. Here we select Mail from the available options, and then click Share button. Enter a recipient in the To filed, and click Send button to deliver the invitation. 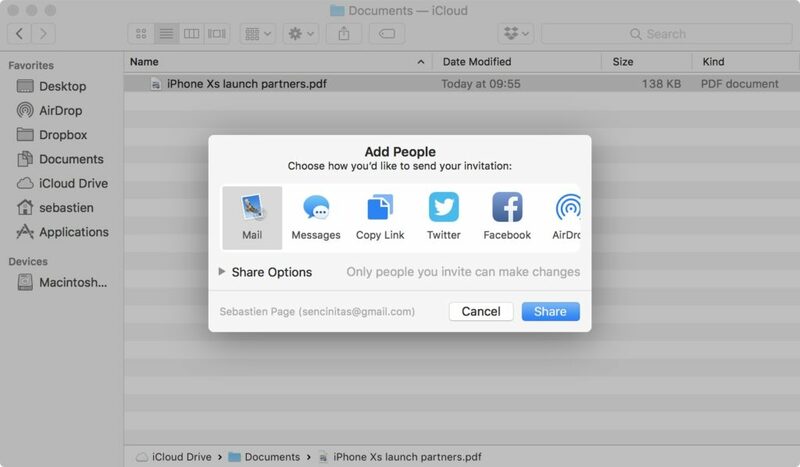 That’s the basic process to share a iCloud file to others in your Contacts. In that case, the people will receive an email with a link to the document you choose to share. By default, the people who have the access to it are also able to make changes to the document. 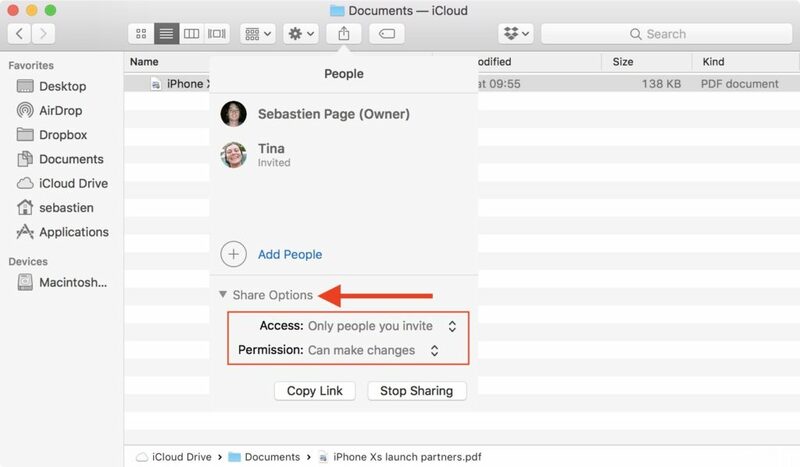 If you don’t want to allow someone to make any changes, you can set up permissions before sharing the document or after the document has been shared. Right click on the document, and choose Share > Show People from the submenu. As the People list displays, click on the Ellipsis icon next to the person you want to change permissions for, and then choose Can Make Changes or View Only. To change permissions for everyone you share with, click the Share Options to show up the Access and Permission box. From there you can determine who can access the document and what permissions (edit or view only) you allow them to have. But what if you want to revoke access to someone or everyone you share the document with? Well, to revoke access to one specific person, click the Ellipsis icon next to this person and choose Remove Access. To stop sharing the document to anyone, click to show up the Share Options menu, and click Stop Sharing button. How to share iCloud Drive documents in iOS 11? You can refer to this blog. Is this post helpful for you? Welcome to leave your comment or advice here.